The long hot summers of our youth seem to have disappeared. On this page we publish three photographs which will revive memories for many of our readers. 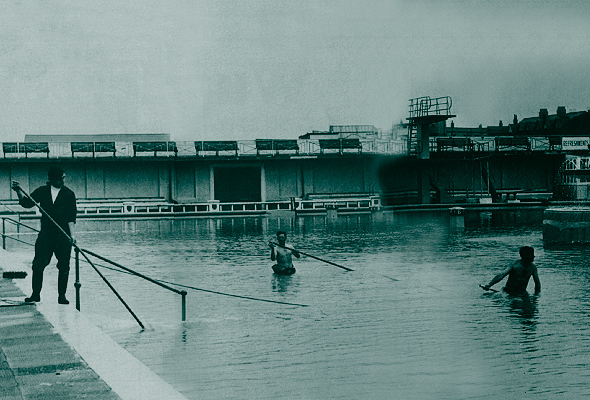 The foreshore open air baths – remembered with much fondness (and freezing conditions) – was a magnet for the youngsters in the holidays. Hundreds learned to swim here. Its mid-fountain and diving board were poplar features. The weekly bathing beauty content was a popular event with our local beauties competing with visitors for the honours. Our photograph shows part of the crowd with the contestants lined up for the judged by the podium on the left. Our third photograph shows the busy funfair outside the baths – a draw for the younger visitors. Ah well! Times change; tastes change and Fleetwood must go “Onward!” as her town motto urged its people. Now part of Wyre Borough, the town has kept many of its unique features, more have been added and more importantly the community spirit must go on. First published in The Fleetwood Annual, 1998.